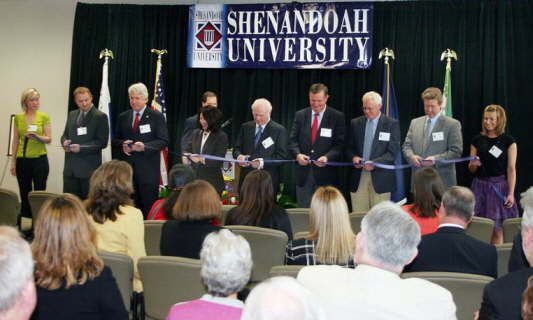 Shenandoah University dedicates its new, 20,000 square-foot Northern Virginia Campus facility, March 30, at 44160 Scholar Plaza in Ashburn, Va. On hand for the ribbon-cutting ceremony are (left to right) Robert Wood Johnson Scholar and SU Nursing Student Stephanie Gaither; SU nursing alumnus Aaron Snow, BSN, RN; Virginia State Senator Mark Herring, 33rd District; Shenandoah University President Tracy Fitzsimmons, Ph.D.; Pruitt Corporation President Cecil Pruitt, Former Shenandoah University President James A. Davis, (1982-2008), Ph.D.; W.A. Hazel Inc. CEO Jay Keyser; W.A. Brown & Associates President Doug Brewer; and Robert Wood Johnson Scholar and SU Nursing Student Kathleen Schneble.